6" Serger Tweezer Scissors for fabric, quilting, embroidery and more at Havel's Sewing. Your source for unique tools for your fabric arts. One of our most popular tweezers, this 6" serger tweezers can be used whenever you need to grasp threads. The serrated tips hold the thread tightly and securely. 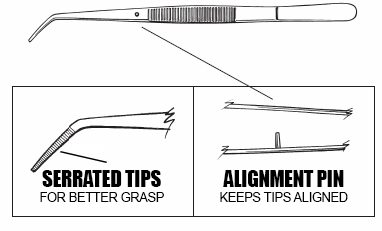 Slight angle makes manuevering easy, while unique alignment pin keeps tips together each and every time.